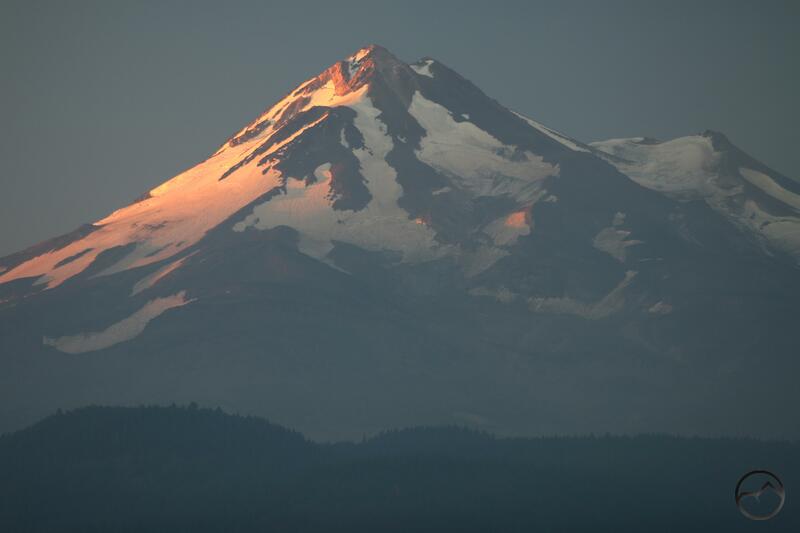 Light from the rising sun illuminates Mount Shasta’s massive Hotlum Glacier. Amazingly, after a month of smoke, little sunlight and no shadows, we have had three clear mornings in a row. Perhaps we really have turned a corner on the ordeal that has been the previous month of summer. 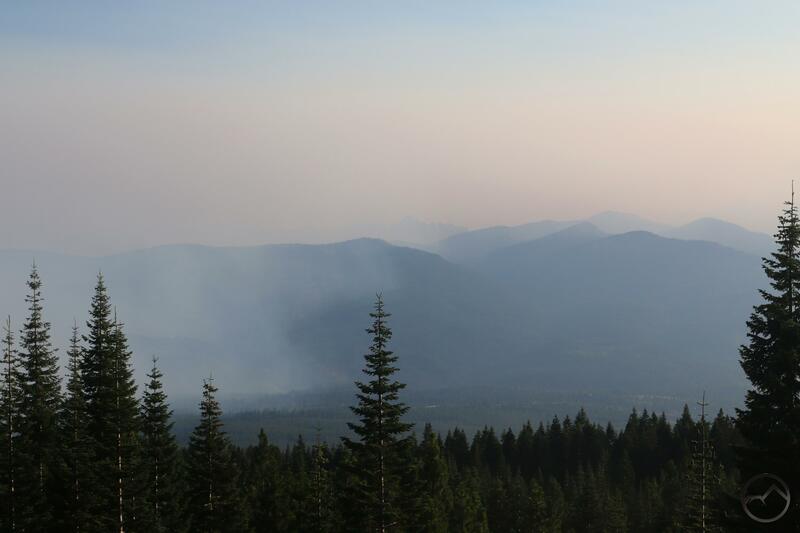 If the smoke returns in force like it was through the rest of August, the last few days sure have been a welcome respite from the depressing conditions we have endured. Up early and seeing clear stars and a white moon, I decided to head over toward the sunrise side of Mount Shasta and see how the mountain looks. What really drove me over there was the paucity of snow on the west side and the knowledge that the mountain’s great glaciers still blanket its rocky flanks. The presence of all the ice on the Mount Shasta really changes its appearance. From the west, with only small patches of snow clinging near the summit, the mountain still looks tall and massive but from the north and east, where the four great glaciers reside, the mountain looks tall and massive and distant. It seems to reside in a different world than where we go about our lives. Seeing the magnificent ice sheets light up with the rising sun was a refreshing and encouraging sight. 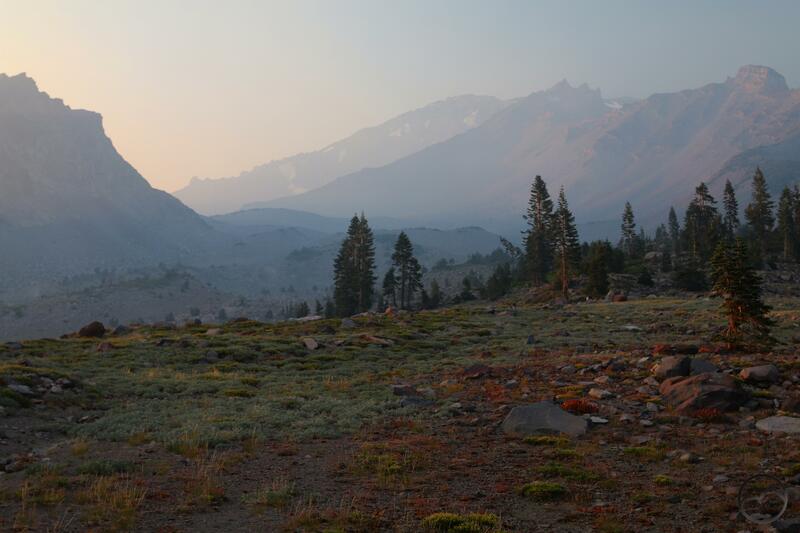 Smoke from the Hirz Fire creeps up towards Mount Shasta. Various layers cover different areas but the large dark gray blob seems to be the mass accumulation of crud in the air. It is a giant stew of nasty particulate and it is covering a huge swath of our continent. It almost gives one a claustrophobic feeling, as though there is no way to escape it. What a waste of a summer. So what is going with the Hirz Fire? There hasn’t been a ton of information, due to the more remote location and lack of immediate human impact that the Carr Fire had. Nonetheless, it is possible to tease out a few details. One I found particularly interesting in the inter-agency press release is that the area currently burning has had no recorded history of fire, other than a few spot fires. This translates to a rich reservoir of detritus lying on the forest floor, all of which makes great fuel for a fire. Add to the excess of fuels the rugged terrain and it makes since that the fire is proving challenging to tame. 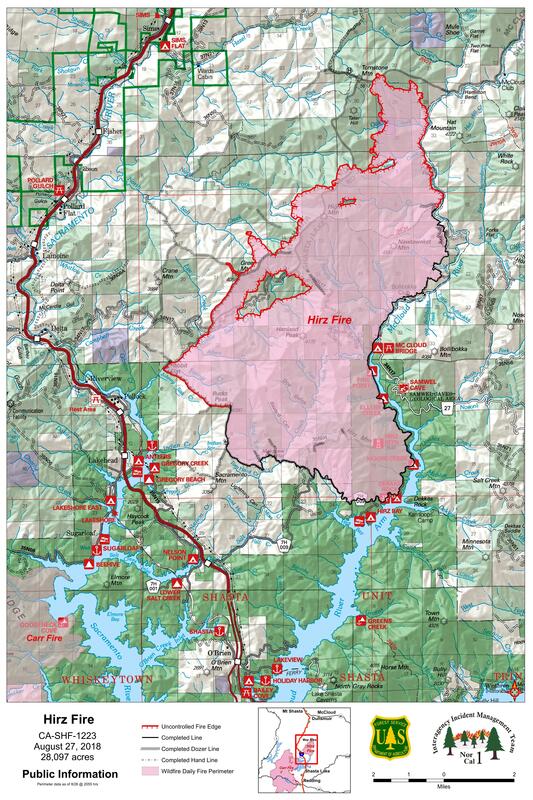 Unfortunately, the Hirz Fire has grown to over 24,000 acres. While the Carr Fire torched several areas along the Sacramento Arm of Shasta Lake, a good chunk of the McCloud Arm has been burned by the Hirz Fire. There is some positive things to report though. 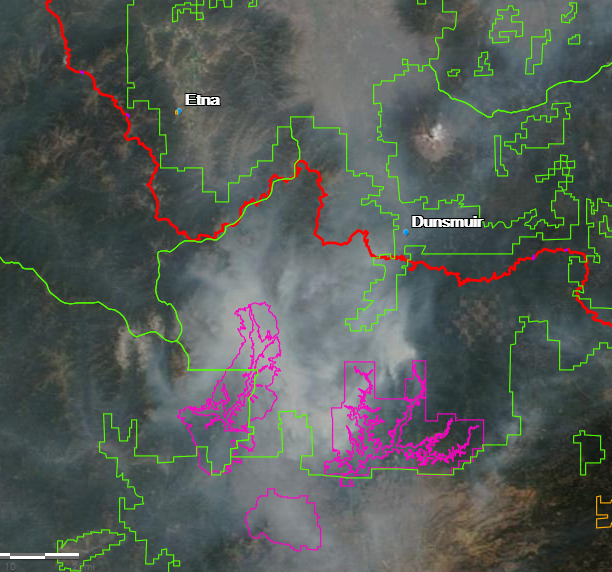 On the map below the black lines around the fire mark areas were containment is set. Note the thin line of pink on the northwest side of the fire. That appears to be a fire line in development, where back burning and other precautions are being implemented. This is what was done to contain the Carr Fire. That means that most of the upper portion of Middle Salt Creek will likely end up being overtaken by the flames. The large salients on the fire lines just to the northeast of the fire break could indicate the presence of other fire lines as well. Observe how the fire reaches the top of the ridge and then stops. This would make sense, since the ridgetop is a natural defensive strong point. Furthermore, crews are currently working on cutting in lines near Tombstone Mountain just to the north. This would represent another pocket for the fire to burn out. 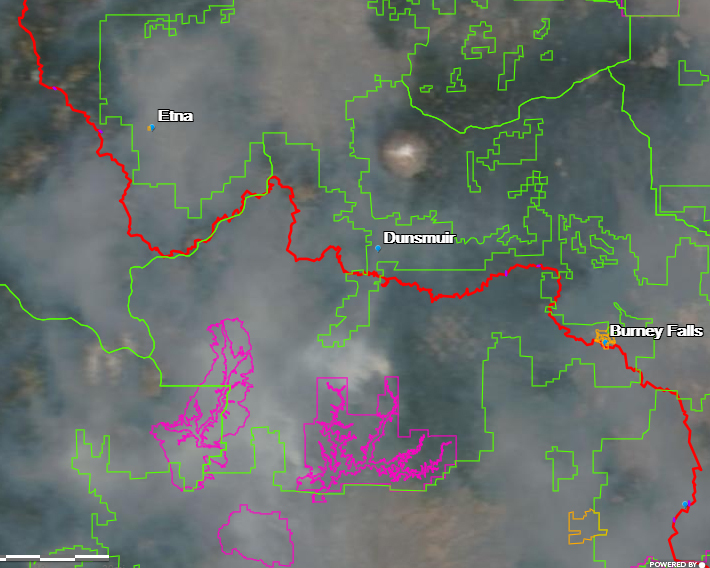 In this case, the McCloud River would block the fire (hopefully) to the east while the ridgetop fire lines hem it in to the west. Let’s hope it works. Of course, while containing the Hirz Fire is important, we must still contend with the accumulated smoke from all the other fires. At this point, what we need is a good rainstorm (with no lightning, thank you very much!) to sweep over the west and douse the fires and clear the air. Nothing seems to be pending on the forecast, dern it. It started off clear at the Old Ski Bowl but grew smokier as the sun set. 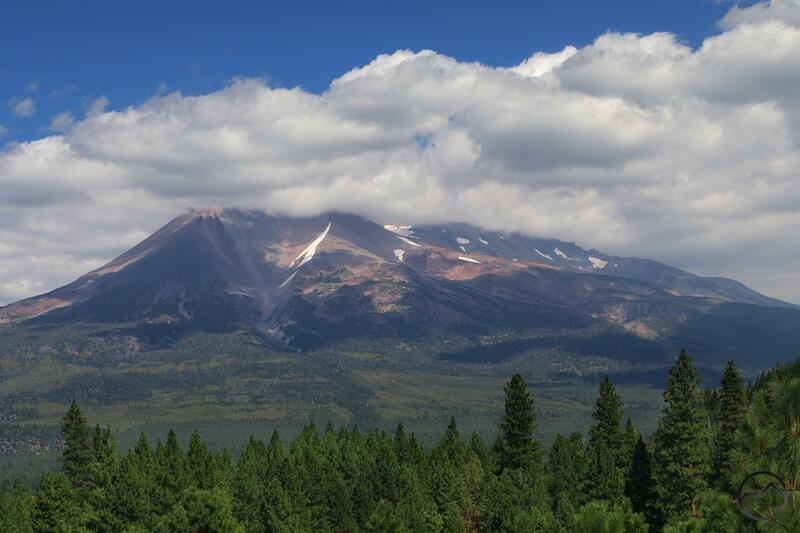 Monday proved to be the nicest day we’ve had in the last month here in Mount Shasta. The sky was blue, the breeze cool and the temperatures weren’t too high. Mostly, however, it was the fact that we had blue sky. There was almost no smoke at all. It was actually a bit jarring to look up and see Mount Eddy, Black Butte and the great blue canopy above it all. Though we had not planned to have another picnic dinner, my wife and I decided to take our kids out and enjoy the beautiful conditions. 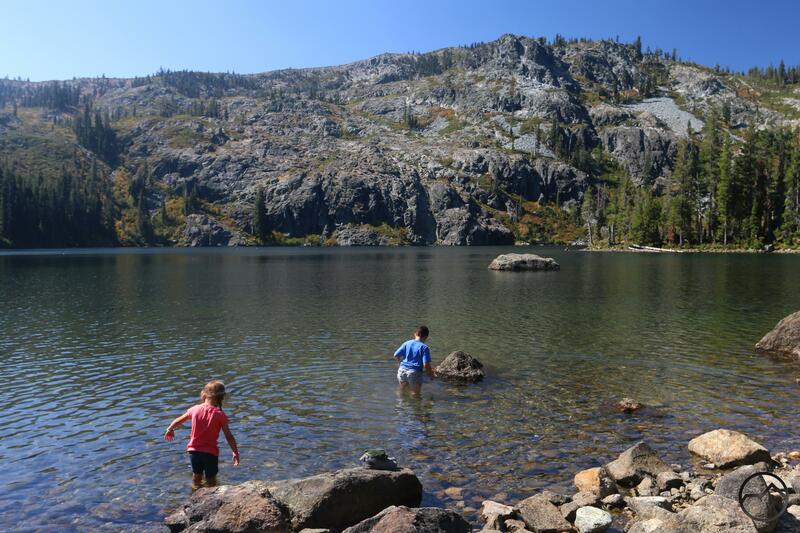 We initially intended to head over to Castle Lake. However, when we got to Lake Siskiyou, we could see a thick layer of smoke creeping up from the south and engulfing the Castle Lake basin. Lake Siskiyou also looked very busy and we figured Castle Lake would be no different. We turned around and headed up to the Old Ski Bowl, which looked to be as clear of smoke as it had the rest of the day. When we passed the Everitt Memorial Vista, we stopped and captured some images of the smoke dramatically creeping north, slowly inching toward town. It was a very eerie sight. Above Lake Siskiyou the smoke pours through the canyons of the Sacramento River. We continued up to the Old Ski Bowl and where we were able to see the smoke drift inexorably northward. Soon the Strawberry Valley was once again choked with the nasty stuff. We were grateful to be above it. In spite of the slight haziness that appeared at the Old Ski Bowl, it was obvious that it was far worse in the valley below. We ate our dinner and the kids ran off to climb on rocks. My wife and I enjoyed the setting and were grateful our kids could have these kinds of experiences. Though a few people arrived and left while we were at the bowl, we were generally the only people at the Old Ski Bowl. This shocked me, since we figured a lot of people would have headed up the mountain since the air quality was really good and the weather nice. Shockingly, we essentially had the place to ourselves. My beautiful wife enjoys the view from our picnic table. My two older kids are complete goofs. 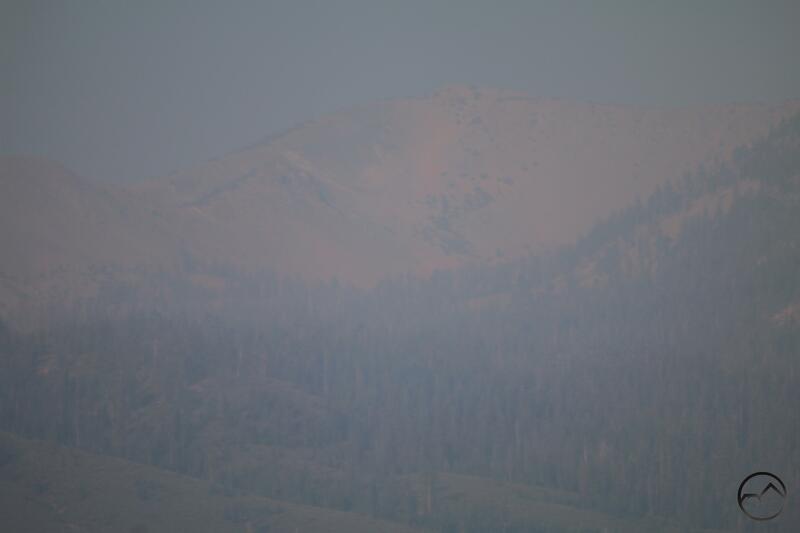 Hummingbird Ridge is turned red by smoke, not alpenglow. The moon rises above Gray Butte and the smoke. The Carr Fire is essentially contained at this point and is not throwing as much crud into the air anymore. That trend should continue. Now we have the Hirz Fire to contend with. Thankfully it is not nearly as large as the Carr Fire and is not producing the amount of smoke as its massive neighbor has done. We also have some smoke rolling in from other regions. Fortunately I think we are past the worse of the smoke (certainly praying that’s the case) and can get back outside and enjoy all the trails that wind through this region. If nothing else we can keep enjoying the Old Ski Bowl. Mount Eddy is the lone mountain still visible through the smoke. 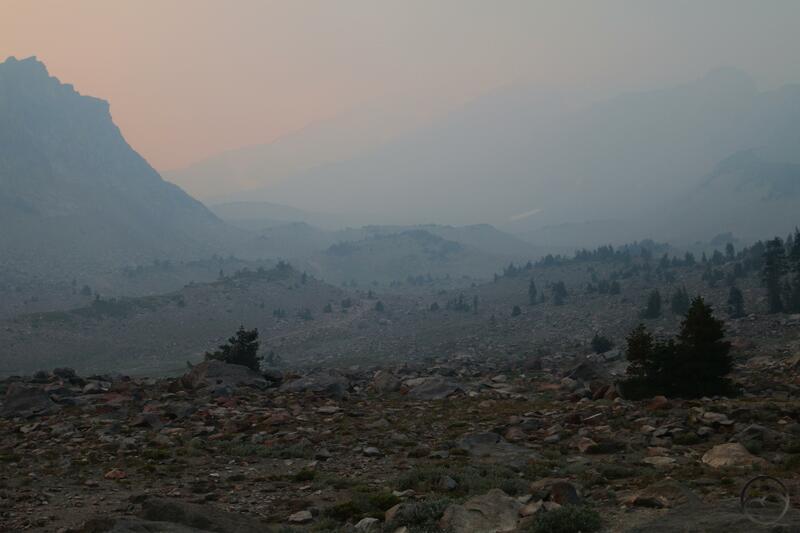 Well….you can sort of see the summit of Mount Eddy through the smoke. It has almost seemed like a wasted month here in Mount Shasta. The Carr Fire has continued to burn, the Hirz Fire has sprung up right next door to it and grown to over 12,000 acres. Worst of all, the smoke has been think, nasty and nearly ubiquitous. However, the last week has seen a slight weakening of this pattern. There have been short stints of clarity as the winds shifted and drove the smoke out of the valley, if only briefly. 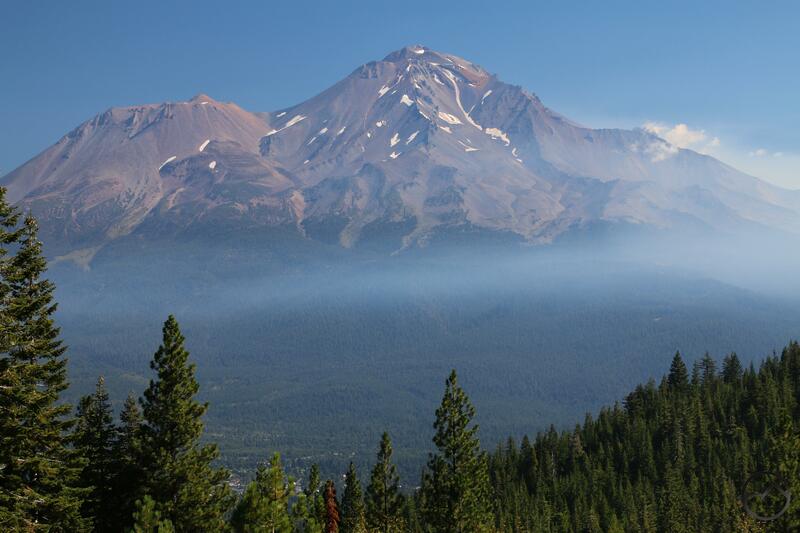 Thursday was the brightest spot, as the air quality improved to the point that Mount Shasta was a clearly visible as it normally should be. This seemed like the first time that had happened in a month. However, even that bright moment was fleeting and the pall of smoke encroached once again, shrouding everything around us so that, even from the Abrams Lake overpass, Black Butte could not be seen. Disgusting. August 17: The smoke covers the Strawberry Valley. 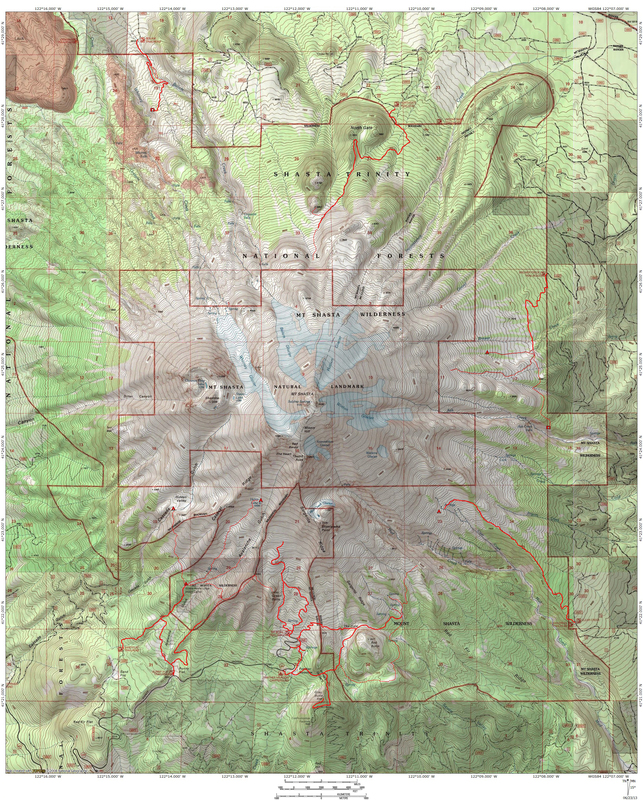 Note that the Trinity Alps are clear. 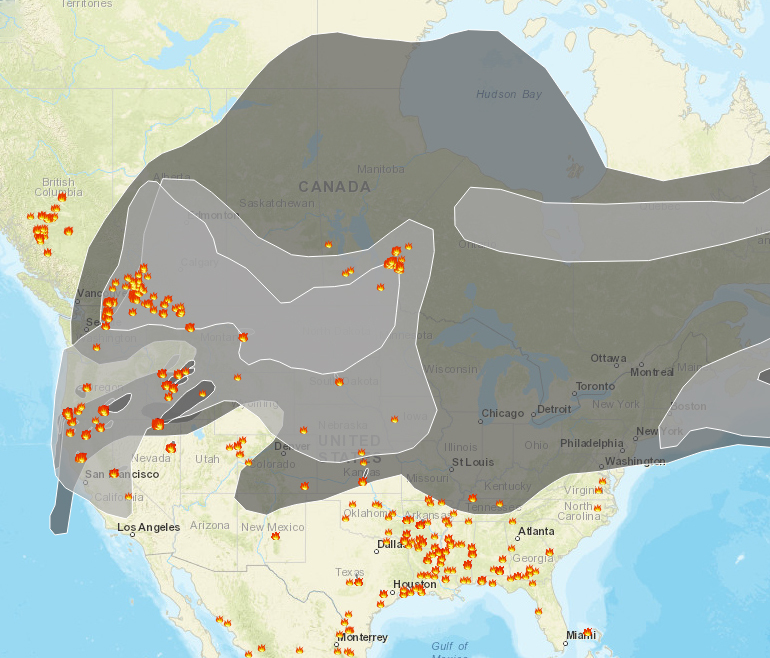 August 18: More smoke covers the entire region. The Strawberry Valley is really socked in. The firebreak is the thin crescent of fire extending from the top of the Carr Fire all the way to Shasta Lake. It is obvious from this progression that the fire is essentially burning itself out. It has consumed everything all the way down to the shore of Shasta Lake. There is nowhere left for the fire to go and there is nothing left to burn. Now it is just a smoldering mess and we can just wait for the smoke to eventually blow away. 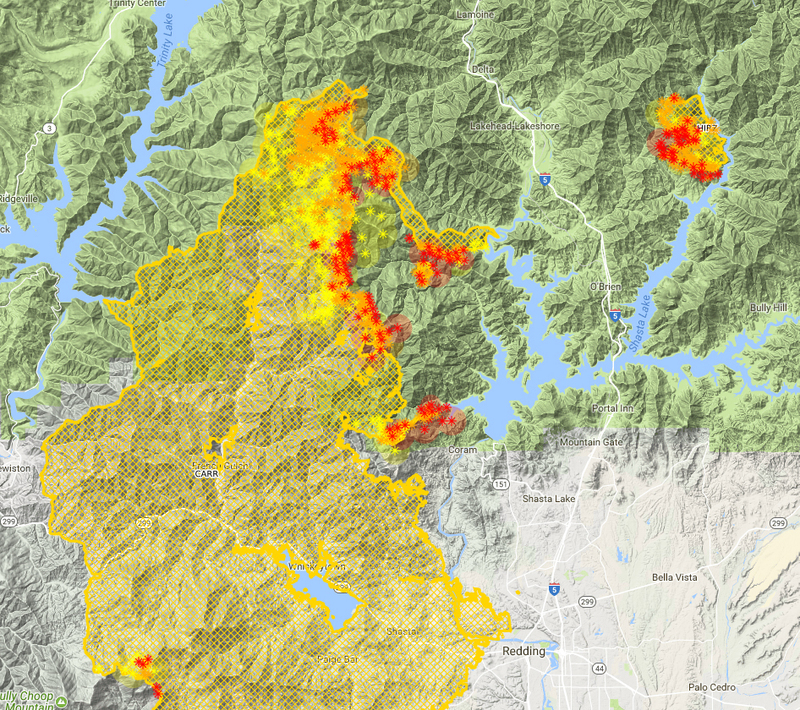 Of course, what this map also reveals is the growth of the nearby Hirz Fire. It is now putting out a significant amount of smoke of its own so we still have that to contend with. However, I hope that the knowledge that we are near the end of the Carr Fire is encouraging. All we are left with then is the charred mountains that hem in the northwest corner of the great Central Valley. In some ways, it brings that area full circle. Much of those hills had been rendered bare by mining operations and other activities at the turn of the century. 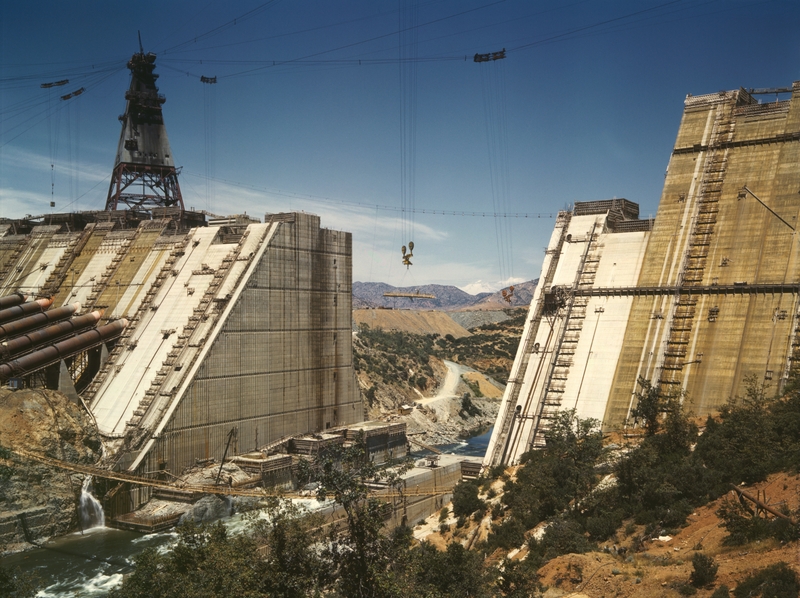 When the Shasta Dam was built, there was little vegetation on the surrounding mountains. We have returned to similar circumstances and get to watch nature heal all over again. Hopefully the air will be the first thing to clean up and soon. Note the bare mountains in the distance through the gap in the dam. They are bare once again. 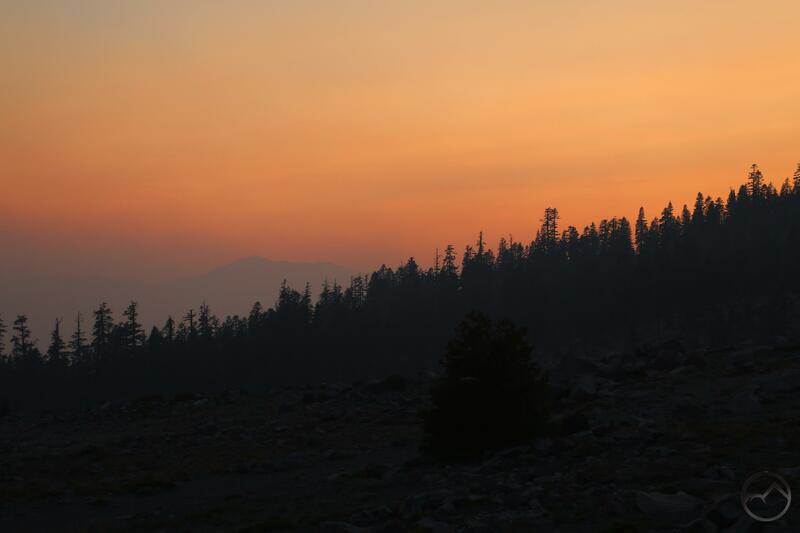 Meager alpenglow illuminates the thick blanket of smoke on Mount Shasta. The last couple of days had somewhat better air quality in Mount Shasta despite the still-burning Carr Fire as well as the addition of the newly ignited Hirz Fire. Nonetheless, the smoke poured back into the area around the mountain with a vengeance today. 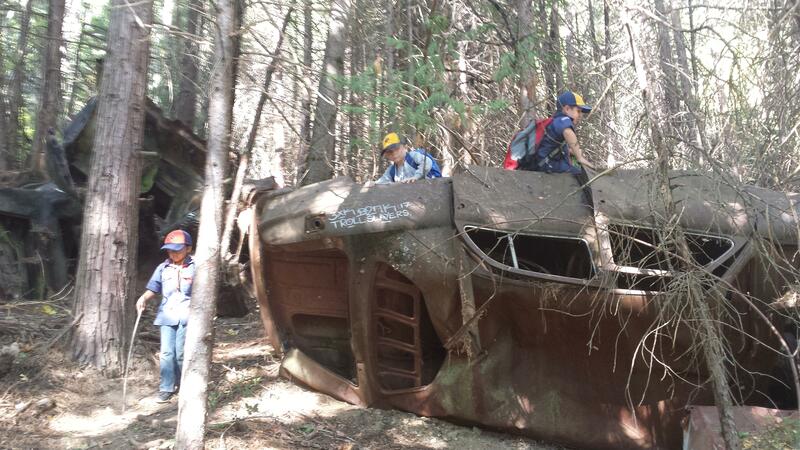 In spite of this, my family and I went up to the Old Ski Bowl to have a picnic dinner. No doubt due to the smoke, the entire mountain from Bunny Flat to the end of the road was strangely empty of activity. It made our dinner strangely eerie. While my kids played on the rocks, my wife and I watched the sun set amidst the smoke. Oddly enough, we spotted someone descending past the sun on a parachute. After this, I managed to capture a few images of the smoky but gorgeous sunset. At least some beauty can be found midst the terrible conditions. Everyone is eager for the smoke to clear out. Hopefully the end is in sight. 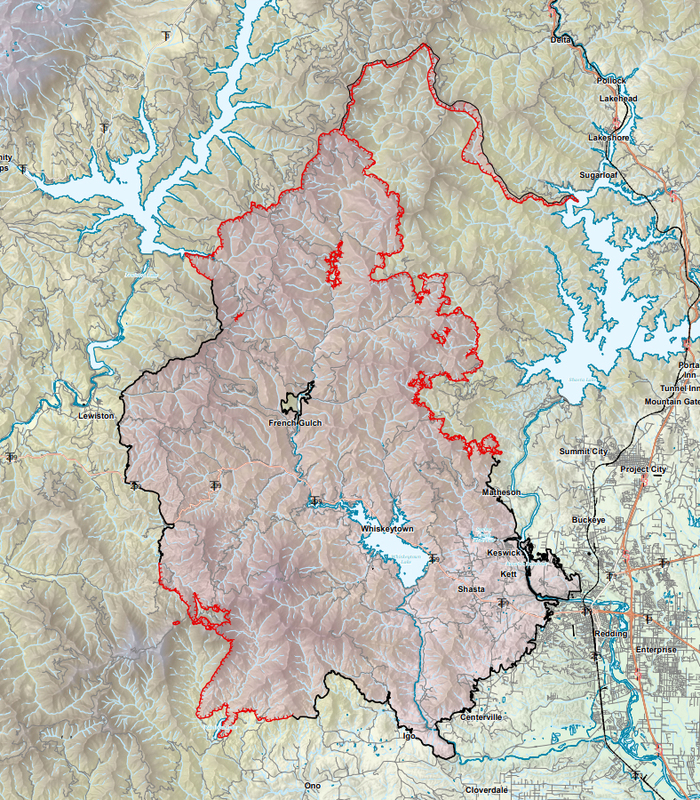 A quick glance at the Carr Fire incident map from 10 August reveals a well-established fire line hemming in the conflagration’s northern advance. Note how the valley below the fire break is filling up but, for the most part, the fire has not advanced past this rallying point. Hopefully the fire line will hold and this will spell the ultimate end of the Carr Fire. 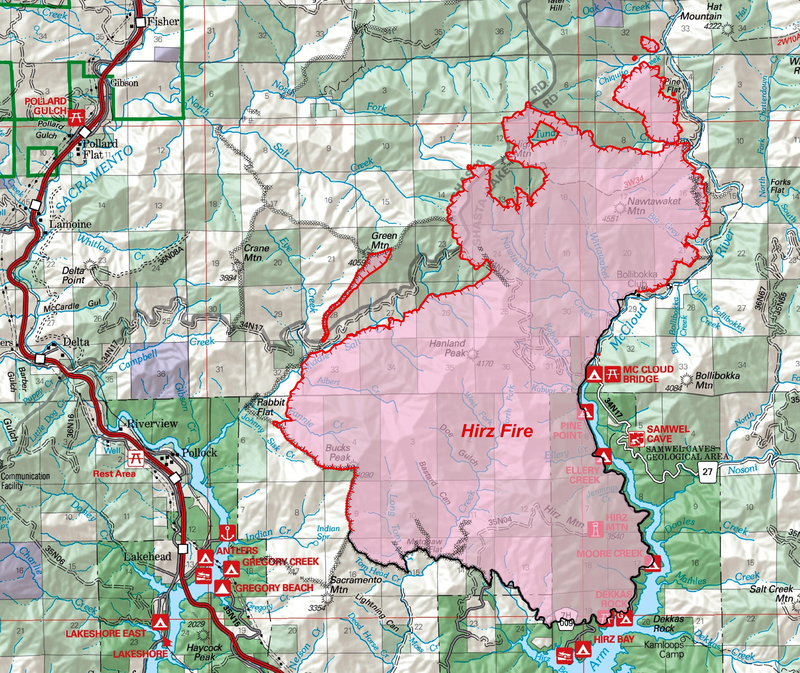 Unfortunately, as is evident from the map, the new Hirz Fire has sprung up along the McCloud arm of Shasta Lake. Let’s pray this fire is brought to heel swiftly. Either way, it feels like, at long last, we are nearing the end of this ordeal. Lord willing. Follow the fire’s progress here.